David Kight coaches from the sideline, during a non-conference girls basketball game between Southern and Athens, on Jan. 31 in Racine, Ohio. TUPPERS PLAINS, Ohio — An experienced leader for an experienced group of Eagles. At a recent meeting, the Eastern Local School District Board of Education approved the hire of David Kight as the varsity boys basketball coach. Kight is replacing Jeremy Hill, who ended his five-year tenure with the Eagles to take the head coaching job at Meigs. Eastern has improved its record in each of the last three seasons, going 10-13 this past winter. “With the boys that I’ve met so far, there’s an extremely great nucleus here,” Kight said. “They have great attitudes and great effort, so we’re excited about it. I think numbers have been pretty good, I’ve seen like 17-or-18 kids in the gym just in the month of June. Kight is a 1994 graduate of Jackson High School, where 11 of of his years of basketball coaching experience came. Kight spent four years with the Western High School boys, with half of his time there as head coach. Then Kight spent two seasons as head coach of the Meigs varsity boys, in which time he led the Maroon and Gold to a sectional crown. Kight spent last season as the head coach of the Southern varsity girls, with the Lady Tornadoes going 7-17 on the year. On the court, Kight plans to fine-tune the motion offense and man-to-man defense that the Eagles are already familiar with. “There are probably going to be more new things on the defensive end, with more switching,” Kight said. “I don’t know how much switching they did last year. It’ll still be man-to-man, but we’ll add some switching and aspects like that. A lot of the motion offense concepts are the same. The Eagles’ 2018-19 campaign will begin at ‘The Nest’ on Nov. 30, with a non-conference bout against River Valley. 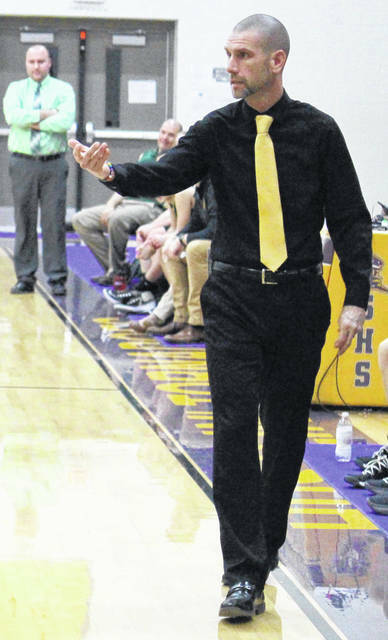 Kight and the Eagles are both looking to return to the Convo for the first time since 2013 and they’ll also try to improve on last season’s 6-10 league record, which placed EHS sixth in the final Tri-Valley Conference Hocking Division standings.